Firefighting crews have arrived on the scene after a huge fire broke out at the Randolph Hotel in the center of the English city of Oxford. "The call was received by fire and rescue at 16:39 and a total of 14 fire appliances have been sent to the Beaumont Street hotel - including two high-reach appliances,” Oxfordshire Fire and Rescue Service said in a statement as cited by the Oxford Mail. "Firefighters have not had to rescue anybody from the blaze and the building has been evacuated." According to eyewitnesses, thick black smoke started pouring out of the 5-star Randolph Hotel. The smoke “stopped very quickly so we thought it was over, and then all of a sudden it resumed again with just as much force,” Anabel Bacon, who was on the roof of a building opposite the hotel, told BBC. "The fire service was there very quickly after the second plume erupted, within five minutes,” she added. Ambulances have also arrived on the scene, but it is not yet known if there are any casualties or injuries, Michelle Archer, South Central Ambulance Service spokeswoman, told The Telegraph. Hundreds of onlookers have gathered at the scene, where at least 70 fire fighters have been battling the flames. “At the moment there are an awful lot of people watching a ladder trying to put out a fire in the roof of the Randolph Hotel,” one of the onlookers, 42-year-old Steve Roe told the Mail. It will take at least year for the Randolph Hotel to resume its operations, according to emerging local media reports. 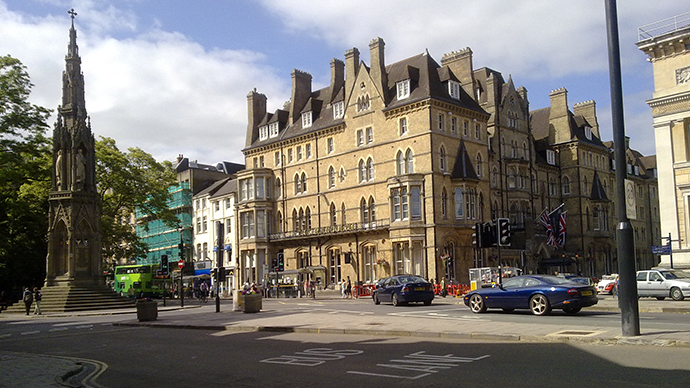 The Randolph Hotel was built in 1864 by architect William Wilkinson. Its gothic façade initially caused controversy as the City Council wanted a classical style for the building. The hotel received its name after the Randolph Gallery in the Ashmolean Museum on the opposite side of the street was established, which itself was sponsored by scholar, Francis Randolph. The luxury hotel had hosted prime ministers and presidents, but is more widely known for providing the set for several episodes of British television series, Inspector Morse.